When you censor student speech, you’re mostly teaching kids to live with censorship. What schools are really teaching students when we let them censor their speech. The Supreme Court will soon decide whether to hear a case involving the suspension of two girls who wore “I ♥ Boobies” wristbands to school. Locker No. 319 at Warren Harding Junior High School in Des Moines, Iowa, is an unlikely historical site. But it seems fitting if you recall that the 13-year-old girl for whom it was dedicated last month is also an unlikely historical figure. In 1962, the middle-schooler who stored her notebooks in that locker was a self-described “shy good girl” named Mary Beth Tinker. Even though she was quiet and a rule follower, Mary Beth was also moved by the carnage of the Vietnam War she was witnessing on television every night. So she, along with her brothers and sisters, decided to wear black armbands to school as a symbol of mourning for the casualties of the war and to signal support for Robert F. Kennedy’s call for a Christmas truce. Having gotten wind of the kids’ plan, the school district spontaneously instituted a “no armband” policy. The children wore them anyhow. The vice principal called Mary Beth out of algebra class and suspended her. Her family sued, claiming the suspension violated her First Amendment rights. The case ultimately made it all the way to the U.S. Supreme Court, and in a 7–2 decision, the justices ruled that students do not “shed their constitutional rights to freedom of speech or expression at the schoolhouse gate.” Writing for the majority, Justice Abe Fortas used language both poetic and sweeping: Students, he wrote, “may not be regarded as closed-circuit recipients of only that which the State chooses to communicate,” nor can they be “confined to the expression of those sentiments that are officially approved.” It was a landmark victory for student speech rights. Mary Beth and her family celebrated that event with ice cream and soda pop. But that was then; this is now. The court is now poised to decide whether to hear the case of two other middle-school girls, Brianna Hawk and Kayla Martinez, who were suspended for wearing wristbands that read “I ♥ Boobies! (Keep a Breast)” to school. The girls claim the bracelets are a way to promote awareness of breast cancer, a disease that has affected both their families. 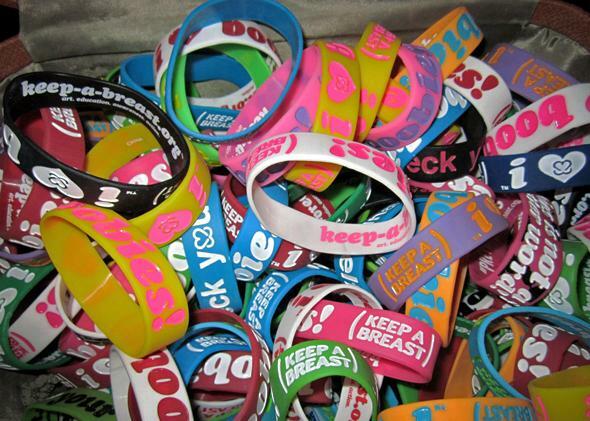 The school claims the bracelets were lewd and indecent. While teaching students civility and protecting them from possibly inappropriate messages are understandable goals, they come with serious costs. Punishing students for their speech robs our public debate of needed voices, and it teaches our children—who, of course, one day become adults—that censorship, even broad and sometimes arbitrary censorship, is acceptable. Although they make up about a quarter of our population, children are not represented in our political system (cue jokes about the House of Representatives now). Children are thus in the unenviable position of being denied the vote, yet they remain the group most likely to be personally affected by government policies. More than 16 million American children, for example, live in poverty and rely on government programs for food, housing, and health care. They are the people who are most impacted by economic recessions. They are the pawns in our unending battles over public education. They experience first-hand issues like teen pregnancy, bullying, drug abuse, homophobia, racism, sexism, divorce, and domestic violence. They will inherit whatever national debt, environment, and global military crises we choose to leave for them to clean up. It’s reasonable to think, therefore, that they might have something to say about these things even if they have no vote in the policies themselves. Along with reading and math, when schools gag their students’ speech, they are teaching them a lesson. Children who are censored grow up to become adults who censor or who tolerate censorship. In nationwide surveys of high-school students, the Knight Foundation has repeatedly found that students who receive instruction on the values of the First Amendment are more likely to agree with statements like “people should be allowed to express unpopular opinions” or “newspapers should be allowed to publish freely without government approval.” Those who are persistently told by their schools that certain speech is off-limits, however, are less certain about these basic freedoms. The attitudes of these young people—as the future protectors of our constitutional liberties—matter. The work of Yale Law professor Jack Balkin and the school’s Information Society Project has shown that public attitudes about free-expression issues affect the direction of Supreme Court rulings. They also found, however, that people are more apt to protect the expression they produce themselves or could imagine doing themselves. Thus students who have a learning environment that is supportive of free and open political debate, journalism, art, theater, and other types of expression are more likely to demand protection for those endeavors as adults. While it might be tempting to quash children and teenagers’ natural inclinations to push back on ideas or to question authority, these very traits are the lifeblood of our constitutional and political discourse. Perhaps the first thing we can do is let them talk. And then maybe, just maybe, we could listen.